We have now created a E-Stim Systems powerbox comparison chart. This allows you to scan through all of our power units and select the one most suited for your needs, based on a number of criteria. If this proves popular, we may even extend this to other non E-Stim Systems power boxes. Size of a powerbox is always a concern, there is no point looking for an E-Stim unit for discreet use, if it is the size of a brick, but if a powerbox is too small, then the controls might turn out to be too fiddly. How much does the unit weigh. The number of outputs determine how many electrodes you can control at any one time. Isolated outputs allow you to control an electrode without any interaction with another electrode, especially important if you are playing near the chest. Why do we not give a specification for the actual output level? Because firstly no other competitor releases such details, and how powerful a box feels is highly dependent on the waveform and position of pads etc. Number of electrodes that can be independently controlled (Although it is possible to use more than one electrode on a channel). Gives you the option to independently control electrodes with no interaction between contact points. Most professional E-Stim units such as ErosTek and PES use an industry standard 3.5mm jack socket. A clear display helps you understand what your powerbox is doing at any one point, the more complex the unit, the more you will need a comprehensive display. Being able to see the display and controls in the dark is obviously useful. LCD is clear and informative, LEDs glow and can be seen in all environments. Not all displays will work in the dark. Are there indicators to tell you exactly what each channel is doing? 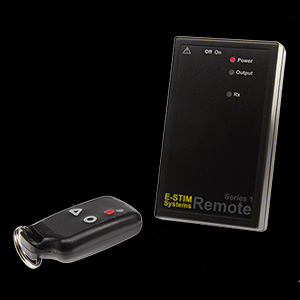 Different and refined program modes is what makes an E-Stim unit exciting, and breaks away from the more static TENS style modes. Audio Modes allow you to use sound to generation sensation, Motion modes allow you to create sensation from movement. Triphase mode makes things go all 3D. More modes can mean more fun, but for some more can be too many. A motion sensor can add to the enjoyment by generating sensation from motion. How many power levels does the box have. The more the better as it gives you finer control. When you turn the box on do the outputs start at zero? Looking to use sound in your play? then consider an E-Stim unit with sound inputs. A built in microphone means you won't loose an important bit, and line in allows control from a MP3 player. What frequency range does the powerbox respond to? A wider range will give more response. Does the unit have a built in microphone? If its built in there is less to loose. Can you connect a MP3 player to play sounds through the powerbox? Sometimes called stereo stimming. Is there some form of display of audio level? Useful when playing different sounds. How does the powerbox 'mix' incoming signals? Can you adjust the audio response? Do you get some form of audio E-Stim sounds to play with? How do you power your E-Stim unit. Rechargeable batteries always seem to run down when the going gets fun, so we try to avoid them. Mains power options give more power and longevity but do mean you have to be near a power socket. Will it run off batteries? Can you replace the battery? Is it easily available? Can you run the powerbox off the mains if you wish? If you are looking to control a powerbox from a PC, Laptop or even a mobile phone? Then here are your options. Can you record and playback 'sessions'? Can the powerbox be controlled from a modern Mac? Can the powerbox be controlled from a modern PC? Can you control the powerbox via E-Stim Connect? Can you upgrade the powerbox yourself? This might be useful if the manufacturer releases new firmware for bug fixes and new modes. One for the techies :: Can you write your own code for the powerbox? Are the protocols available? *requires optional Digital Link Interface and compatible PC or Mac. The ability to adjust the output means you can create a sensation that is right for you. The more control you have the better. How do you control the output level. rotary control are fast and responsive. How many different ways can you adjust a waveform? Is the switch hardwired or is it a press and hold? Hardwired switches tend to stay switched off when you place them in a bag. If there is any more comparison information that you feel would aid you in your quest for the best in E-Stim technology, then please do not hesitate to ask.